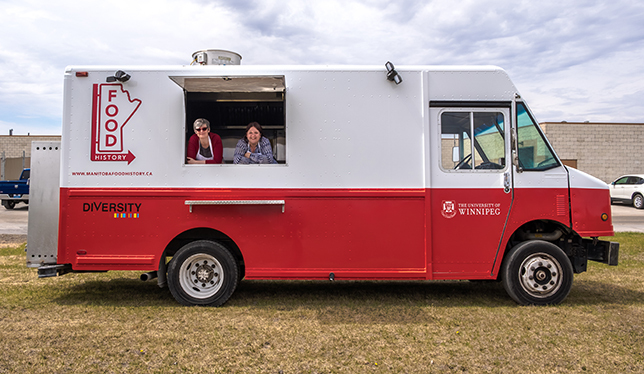 With the help of a food truck, a team of historians is collecting recipes – and the stories behind them – from Manitobans around the province. The food truck is parked on the edge of the parking lot at the Mennonite Heritage Village in Steinbach, Manitoba. Although my eyes are drawn to the neat red and white paint job, this food truck is not particularly showy. Its lack of pretention reminds me of its progenitor, Janis Thiessen, the principal investigator with the Manitoba Food History Project and the Food History Truck. Janis Thiessen and Sarah Story inside the Food History Truck from the Manitoba Food History Project. Photo by Kimberley Moore. Indeed, as Dr. Thiessen invites me inside to talk, she is quick to explain that her collaborators, Kent Davies and Kimberley Moore at the University of Winnipeg’s Oral History Centre, project coordinator Sarah Story and summer student Rochelle Richards, are every bit as integral to this project as she is. For Dr. Thiessen, though, this truck is a dream come true. A professor of business history at U of Winnipeg, Dr. Thiessen has looked for ways to connect academic research with everyday life in unconventional, unintimidating ways. Her food truck, a former FedEx delivery vehicle, now serves as a place to both make food and conduct safe interviews. “There is increasing attention in the oral history community to the potential risks of visiting comparative strangers alone in their homes to do oral history interviews,” Dr. Thiessen says. “Interviewing in the food truck is safer for project employees because it is somewhat public.” By cooking together in the relative privacy of the truck, she adds, interviewees are made to feel at home as they share recipes and the personal stories behind them. As the truck travels to Steinbach, Parkland and Winnipeg this spring and summer, the team is seeking out home cooks, food retailers and food producers of all kinds. “We are particularly interested in interviewing those whose businesses … have had long tenures in this province, and in home food producers – cooks, gardeners – with interesting or unique stories to tell,” this history professor explains. The team has been making its findings – a unique blend of recipes and oral history – widely available through a project website, social media and other digital storytelling projects, including a podcast called Preserves. 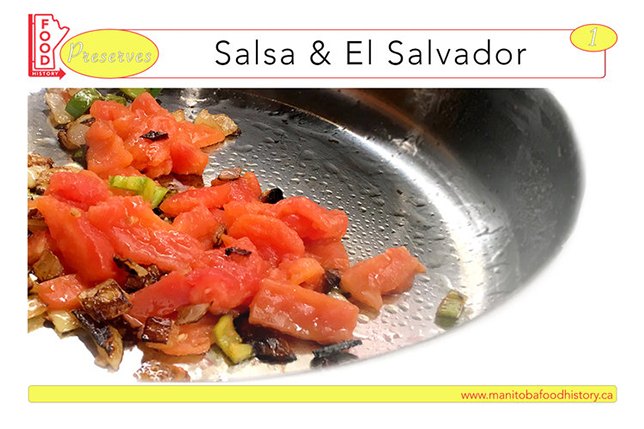 Its first episode, “Salsa,” includes a recipe and a fascinating story of migration from El Salvador to Manitoba. As Dr. Thiessen and I continue our conversation inside the truck, an older woman walks up to the window and asks if we are serving food. “No,” Dr. Thiessen says kindly, “but we are looking for recipes.” She hands the tourist one of her cards. Another seed sown.